Engineering drawing. This locomotive, with its sister locomotive 'Wylam Dilly', is the oldest surviving locomotive in the world. Puffing Billy was designed and built by William Hedley for use at Wylam Colliery, in the north-east of England. It ran over a five-mile stretch of track between Wylam and the staithes at Lemington-on-Tyne between 1813 and 1861. 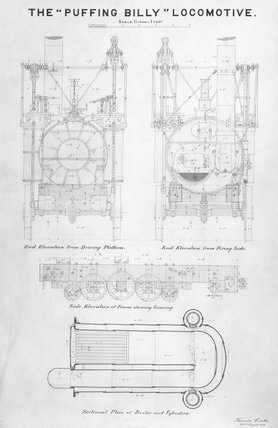 The Science Museum acquired Puffing Billy in 1862, after nearly fifty years of continuous service and several rebuildings.